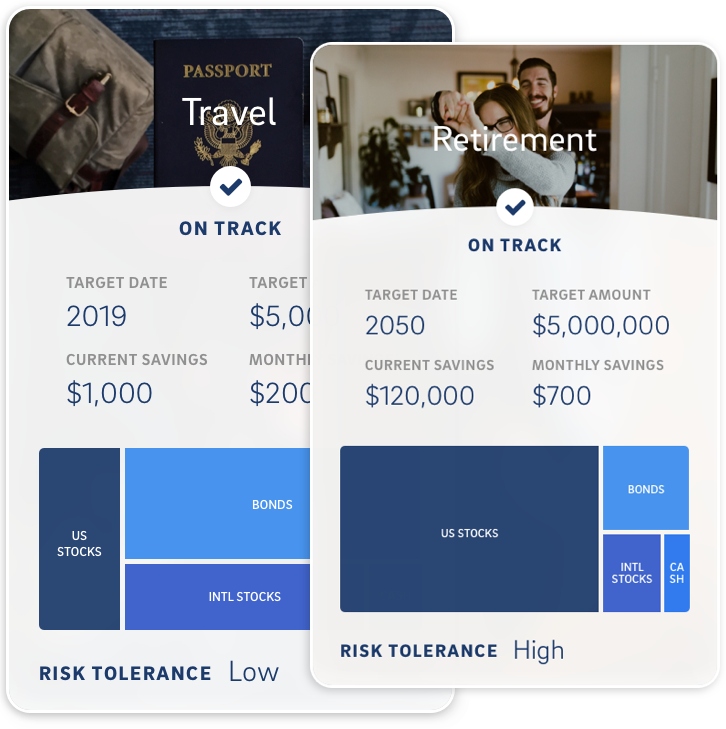 Once you've set up your personal goal, BrightPlan can automate investing in a BrightPlan Investment Account to help you stay on track with your plan. You can also apply our advice in your external investment accounts when linked to a BrightPlan goal. Capital markets do a good job of fairly pricing all available information and investors’ expectations about publicly traded securities. The market has already done most of the work. Rather than working to beat the market, let it work for you. Most investors are neither diversified enough, nor properly diversified. We manage risk through smart diversification based on Modern Portfolio Theory. Our model portfolios invest in a global mix of over 10,000 stocks and bonds, yet you can start with as little as $500. Dimensional Fund Advisors is one of the world's largest mutual fund providers, managing over $500 Billion primarily for institutions and high-net-worth individuals. Their rigorous, evidence-based approach to investing has led to great historical results. In the 15-year period between 2002 and 2017, 73% of Dimensional Funds beat their benchmark, while only 14% of their peers could boast the same. The only way to access DFA funds is through an approved Registered Investment Adviser like BrightPlan. Make automatic progress towards your goals with a BrightPlan Investment Account. Open an investment account for each of your goals and relax knowing your investment plan fits your resources, risk tolerance, and timeframe. Choosing investments can be overwhelming. So we analyze, select, and monitor investments for you. Your plan on auto-pilot. Set up one-time or recurring contributions, we’ll invest them automatically. If market movements push your portfolio out of balance, our software automatically nudges it back on track. We reduce the need to sell funds by reinvesting dividends to rebalance your account. Our tax aware portfolio construction and periodic tax loss harvesting work to improve your after-tax returns (the only returns that matter). BrightPlan offers fiduciary advice at a much lower price tag compared to traditional advisors.5 We keep expenses low: no commissions, kickbacks, or fees, which keeps our advice aligned to clients' best interests. Opened at TD Ameritrade. Managed by BrightPlan. Owned by You. BrightPlan Investment Accounts are opened in your name at TD Ameritrade Institutional, a top-tier custodian safeguarding over $1.1 Trillion in investors' assets with their asset protection guarantee. BrightPlan selected TD Ameritrade Institutional as our preferred custodian because of their robust technology integrations, strong track record as a custodian for over 6,000 Registered Investment Advisors, and low fees for trading and account management. Through TD Ameritrade, mutual funds and cash held in BrightPlan Investment Accounts are protected by SIPC and FDIC insurance. (*) TD Ameritrade and BrightPlan are separate and unaffiliated firms, and are not responsible for each other’s services or policies. TD Ameritrade does not endorse or recommend any advisor and the use of the TD Ameritrade logo does not represent the endorsement or recommendation of any advisor. Brokerage services provided by TD Ameritrade Institutional, Division of TD Ameritrade, Inc., member FINRA/SIPC. TD Ameritrade is a trademark jointly owned by TD Ameritrade IP Company, Inc. and The Toronto-Dominion Bank. Used with permission. OUR ANNUAL FUND COST VS. THE INDUSTRY AVG. Dimensional Statistic: Performance data shown represents past performance and is no guarantee of future results. Beginning sample includes funds as of January 1, 2002. The number of beginners is: Industry - 3,545 and Dimensional - 29. Outperformers (winners) are funds with return observations for every month of the 15-year period whose cumulative net return over the period exceeded that of their respective benchmark. US-domiciled open-end mutual fund data is from Morningstar and Center for Research in Security Prices (CRSP) from the University of Chicago. Performance of each fund in the industry sample are evaluated relative to the fund’s Morningstar Category Index. Dimensional fund data provided by the fund accountant. Dimensional funds exclude VA funds and those distributed exclusively through Loring Ward. Performance of Dimensional funds measured against prospectus benchmarks. When evaluating the Dimensional funds relative to the fund’s Morningstar category index, 79% outperform. For further methodology details, see DFA’s Mutual Fund Landscape brochure. Vanguard Statistic: For the 10-year period ended December 31, 2017, 9 of 9 Vanguard money market funds, 51 of 55 Vanguard bond funds, 21 of 22 Vanguard balanced funds, and 101 of 108 Vanguard stock funds—for a total of 182 of 194 Vanguard funds —outperformed their Lipper peer-group average. Results will vary for other time periods. Only mutual funds with a minimum 10-year history were included in the comparison. The competitive performance data shown represent past performance, which is not a guarantee of future results. How we calculated fund costs: BrightPlan fund costs are a weighted average of all of the funds included in a taxable BrightPlan Investment Account holding 60% stocks and 40% bonds. Industry averages are based on the asset weighted average fund costs of all US Mutual Funds from the Morningstar US Fund Fee Study 2016. Because the weightings of funds are different in every model portfolio, clients invested in BrightPlan model portfolios could have fund fee averages ranging between 0.13% and 0.28%. How we calculated our monthly costs v.s Industry: BrightPlan trading fee assumes the 0.08% asset based trading fee with an average of a $50,000 balance over the course of the month. Industry trading fee assumes $5 per trade and 6 trades per month to invest monthly deposits, reinvest dividends, and rebalance a diversified portfolio. These values are meant for illustration and do not necessarily reflect a specific client. If your account value is higher (lower) the monthly trading cost in a BrightPlan Investment account will be higher (lower).